Let’s talk about broken bones in children. Let’s face it, we know kids are rambunctious, full of energy, and something is bound to happen at some point with all that running and jumping around. In my whole life…knock on wood…I have never broken any bones. I have kids and ….knock on wood…they have not yet either. One night last week, I picked my kids and their friend up from summer camp and took them home. While I started dinner, the kids were upstairs playing. Next thing I know, my daughter came running to me telling me her friend fell and hurt both her wrists. Not thinking it was anything, I started to walk to the staircase until I heard the crying. Now as a parent you can always tell the difference of the crying when something is really major and I broke into a run up the stairs. That’s where I saw her…poor thing was laying on the ground as my kids hoovered in the hallway. She had fallen and told me she hurt both wrists. Dear lord…in the house of a hand therapist without her parents, I couldn’t help but think! 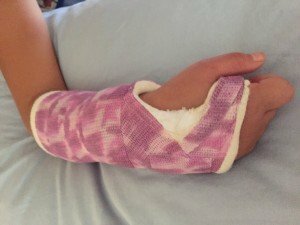 She had in the past broken both her wrist before…so clearly I was fearing the worst! Let me tell you what they were doing. We have a pull-up bar, the kind that you can put up and take down. Several weeks before, we saw them climbing up the sides of the door to get to the pull up bar and swing on them like monkey bars, then we saw them swing on them and jump as far as they could like gymnastic bars. Okay! Enough kids! That bar was coming down and you can’t play with it like that! So while I was rushing to make dinner, they all decided to put it up. One climbed up as the other handed him the bar to put up. Well, they worked together as a team…all was going great, each taking turns. Until she slipped and fell, on both wrists. I carried her down stairs and put my gel ice pack on both wrist right away, then in a few minutes trying to see if she could move it. As soon as I touched one of the wrist, I could tell that, it was most likely that one that was broken. Her mother and I decided to take her to the ER to have x-rays taken. By then, she had calmed down but unwilling to go. I was able to convince her that since I was an expert hand therapist (hahaha) that I would make sure she was ok. I found one of my son’s shin guard (because who keeps wrist support splints at home?!?! ), aced wrapped it in place to help make her feel more secure. And off we went to the ER. There it was confirmed that she had broken her distal radius, the bone by the wrist closest to the thumb. 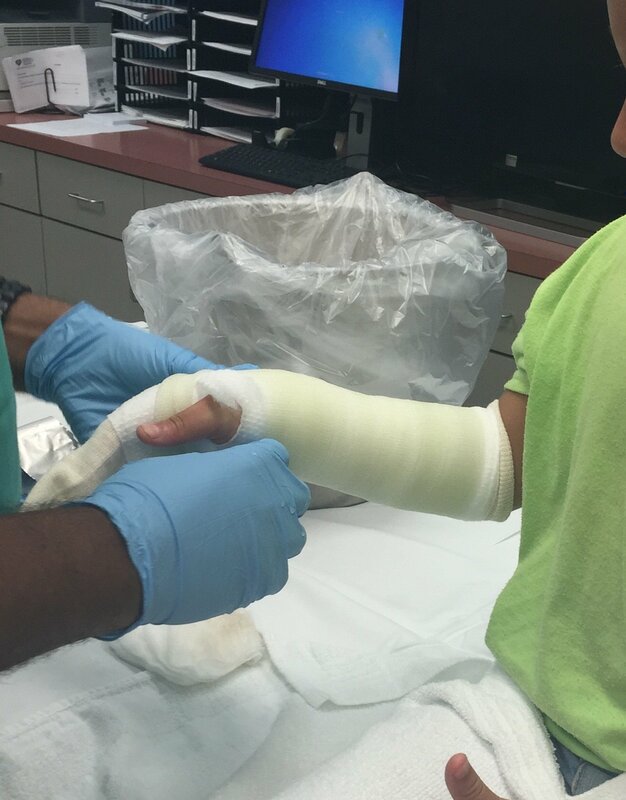 At least it wasn’t too displaced (separated) and she was able to have it cast. For the most part, kids do great after casting, few need therapy at all. The most important thing is to keep the injured part elevated to help with the swelling. 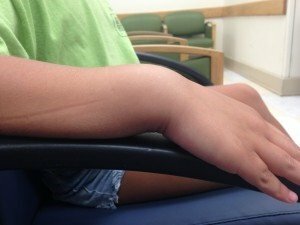 Make sure if it’s the hand/wrist, that the hand is higher then the level of the elbow in an incline to help with the swelling. Icing can also help with the pain at the parts that are not covered in the cast. It’s hard to ice through the cast as it is thick. Doctor says 4 weeks and the cast can come off!! Can’t wait! I?¦ve been exploring for a little for any high-quality articles or weblog posts on this kind of house . Exploring in Yahoo I at last stumbled upon this web site. Reading this information So i?¦m satisfied to exhibit that I’ve a very just right uncanny feeling I came upon exactly what I needed. I so much indisputably will make sure to don?¦t put out of your mind this site and give it a look on a constant basis.